An air Circuit Breaker (ACB) is an electrical device used to provide Overcurrent and short-circuit protection for electric circuits over 800 Amps to 10K Amps. These are usually used in low voltage applications below 450V. We can find these systems in Distribution Panels (below 450V). Here in this article, we will discuss the working of Air Circuit Breaker. Air circuit breaker is circuit operation breaker that operates in the air as an arc extinguishing medium, at a given atmospheric pressure. There are several types of Air circuit breakers and switching gears available in the market today that is durable, high-performing, easy to install and maintain. The air circuit breakers have completely replaced oil circuit breakers. Air circuit breakers operate with their contacts in free air. Their method of arc quenching control is entirely different from that of oil circuit-breakers. They are always used for a low-voltage interruption and now tends to replace high-voltage oil breakers. The below-shown figure illustrates the principle of air breaker circuit operation. Air Circuit breakers generally have two pairs of contacts. The main pair of contacts (1) carries the current at normal load and these contacts are made of copper metal. The second pair is the arcing contact (2) and is made of carbon. When the circuit breaker is being opened, the main contacts open first. When the main contacts opened the arcing contacts are still in touch with each other. As the current gets a parallel low resistive path through the arcing contact. During the opening of main contacts, there will not be any arcing in the main contact. The arcing is only initiated when finally the arcing contacts are separated. The each of the arc contacts is fitted with an arc runner which helps. The arc discharge to move upward due to both thermal and electromagnetic effects as shown in the figure. As the arc is driven upward it enters in the arc chute, consisting of splatters. The arc in the chute will become colder, lengthen and split hence arc voltage becomes much larger than the system voltage at the time of operation of air circuit breaker, and therefore the arc is extinguished finally during the current zero. The air brake circuit box is made of insulating and fireproof material and it is divided into different sections by the barriers of the same material, as shown above, figure (a). At the bottom of each barrier is a small metal conducting element between one side of the barrier and the other. When the arc, driven upwards by the electromagnetic forces, enters the bottom of the chute, it is split into many sections by the barriers, but the each metal piece ensures electrical continuity between the arcs in each section, the several arcs are consequently in the series. The electromagnetic forces within each and every section of the chute cause the arc in that section to start the form of a helix, as shown above, figure (b). All these helices are in series so that the total length of the arc has been greatly extended, and its resistance is abundantly increased. This will affect the current reduction in the circuit. Figure (a) shows the development of the arc from the time it leaves the main contacts until it is within the arc chute. When the current next ceases at a current zero, the ionised air in the path of where the arc had been being in parallel with the open contacts and acts as a shunt resistance across both the contacts and the self-capacitance C, shown in below figure with red as a high resistance R.
When the oscillation starts between C and L as described for the idealised circuit breaker shown in Figure below, this resistance damps the oscillation heavily. Certainly, it is usually so heavy that the damping is critical, the oscillation cannot then take place at all, and the restriking voltage, instead of appearing as a high-frequency oscillation, rises dead-beat to its eventual value of peak generator voltage. This is shown below the lower waveform. The air circuit breakers are mostly of three types and are widely used for maintaining the indoor medium voltage and switch gears of the home. Plain brake air circuit breakers are the simplest form of air breakers. The main points of contacts are made in the shape of two horns. The arc of these circuit breakers extends from one tip to the other. In air chute air break circuit breaker, the main contacts are usually made up of copper and conduct current in closed positions. Air chute air break circuit breakers have low contact resistance and they are silver plated. The arcing contacts are solid, resistant to heat and are made up of copper alloy. Air Circuit Breakers are used for controlling the power station auxiliaries and industrial plants. They offer protection to industrial plants, electrical machines like the transformers, capacitors, and generators. They are mainly used for protection of plants, where there are possibilities of fire or explosion hazards. The air brake principle of the air breaker circuit arc is used in DC circuits and AC circuits up to 12KV. The air circuit breakers have high resistance power that helps in increasing the resistance of the arc by splitting, cooling and lengthening. A drawback of arc chute principle is its inefficiency at low currents where the electromagnetic fields are weak. The chute itself is not necessarily less efficient in its lengthening and de-ionizing action than at high currents, but the arc movement into the chute tends to become slower, and high-speed interruption is not necessarily obtained. Thus, this is all about Air Circuit Breaker (ACB), its working and applications. We hope that you have got a better understanding of this concept. Furthermore, any doubts regarding this concept or to implement any electrical and electronic projects, please give your feedback by commenting in the comment section below. Here is a question for you, what is the function of ACB? 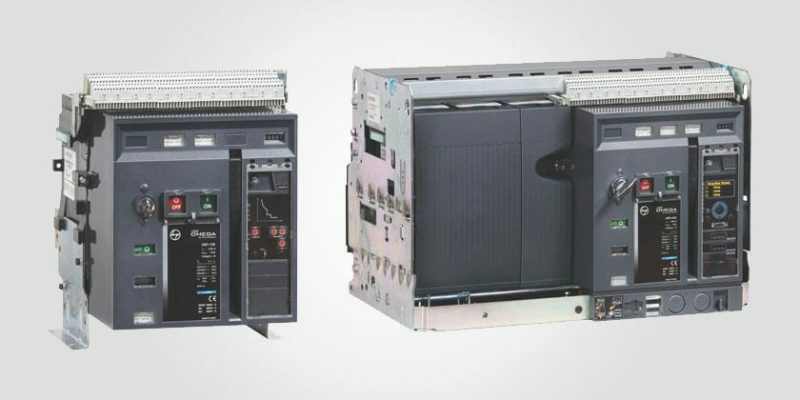 Air Circuit Breaker (ACB) is an electrical device used to provide Overcurrent and short-circuit protection for electric circuits over 800 Amps to 10K Amps. These are usually used in low voltage applications below 450V. We can find these systems in Distribution Panels (below 450V). Here in this article, we will discuss the working of Air Circuit Breaker. Air circuit breaker is circuit operation breaker that operates in the air as an arc extinguishing medium, at a given atmospheric pressure. There are several types of Air circuit breakers and switching gears available in the market today that is durable, high-performing, easy to install and maintain. The air circuit breakers have completely replaced oil circuit breakers.